Designation : Your designation please! Due to heavy rush your download my take more than 20 seconds. Please wait for few seconds once yoy click on the download button. Your Download will start automatically. Dr. V Kumar, KIOT, Salem. It is a great and excellent work professor. Proud to have such persons in this noble profession. I always write WHAT I FEEL FOR U in my heart. If there is an Indian Nobel Prize for writing Books, I MUST RECOMMEND it for Rajiv Dharaskar. Thanks a million for sharing your book. I am grateful. This book seems to be interesting. We need this kind of books as morale booster.. I want to thank you from bottom of heart and on behalf of whole teachings fraternity for such awesome piece of work... Sir ur doing a wonderful work. Whole education community will always indebted for ur noble cause. Truly said that next slogan will be "Innovation India." I am amazed by the facts and it really go unnoticed how innovation plays such a big role in a country's economy...It is really a good work..
..for writing this book on very important subject in today’s context. ..It is always a delight to read your contributions to the field.. It's really inspiring for all of us to see you exploring new areas all the time. You have been blessed by almighty for good orientation, efforts and all that ios needed for such projects. you are my inspiration. 15 Dr. Prakash Bapat, Principal, Pune, Alumni of IISc Banglore ..cover all the aspects of the related to innovation and its impact on economy development and the GDP growth rate It certainly going to be a main source book for all planners and the people in industry. It gives a very carefully collected information on impact of innovation on the economy. 16 Dr. Sanjay Toshniwal, Educationist and IPR Consultant, Aurangabad My heartiest congratulations for your endeavors in putting remarkable compilations and thoughts in earlier 5 books and now on INNOVATIONS for the world Academia, Researchers and policy makers. Your dedication and positivity … deserves salutation. 17 M.C. Paul, Professor, School of Social Sciences, Jawaharlal Nehru University, New Delhi I am sure it will catch the imagination of the new generation who believe in innovation and progress. 18 Dr. Rupesh Vasani, Principal at SAL Institute of Technology & Engineering Research, Ahmedabad we pray to GOD that through this book we will make "Innovation India"
20 Yashawant P Bhalerao, Department of Chemical Engineering, Shroff S R Rotary Institute of Chemical Technology, Ankleswar, Gujarat I really appreciate the efforts and hard work done by you. I am indebted to you by reading this book. Really it worth praise (both for this book which is an innovation in itself, and for the noble movement taken up by you). 22 Prof. Harshad B. Prajapati, Associate Professor, Information Technology Department, Faculty of Technology, Dharmsinh Desai University, Nadiad, Gujarat, Its a good work on innovation with focus on broad perspectives. I see its usability to students, to academicians, to industrial practitioners, and to everybody who needs or wants innovation in their endeavors. Really impressed by the contribution you have made for the cause of innovation. We expect many more such additions. 25 Dr. K. S. Chari, Ex-Scientist, MCIT, GOI, New Delhi It';s a nice compilation bringing together various facets of developments in the title area; and could serve as good referral source. 26 Dr. Satya P. Gupta, FNASc, Ex-Professor BITS, Pilani, Ex-Distinguished Professor MIET Meerut, Professor (NITTTR) Bhopal It is really painstaking job. I am very much impressed with your "Innovation". 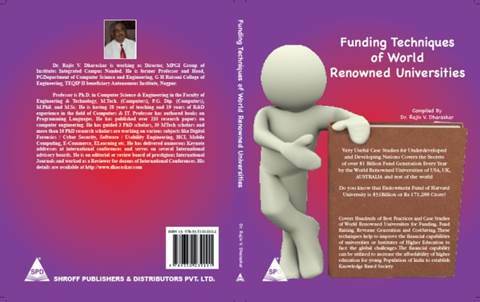 27 Dr. S. S. Thipse, Deputy Director, Power Train Engineering, The Automotive Research Association of India, Pune I am sure this new book of yours will benefit the research community as whole. I found the case studies really inspiring. 28 Dr. Tarun Bikash Sukai, Assam (Central) University Silchar Thanks a ton for sending me a copy of this master piece! 29 Dr. Kirti Dixit, Vice ChancellorGondvana University, Gadchiroli You deserve compliments for the innovative way making your contributions in acedemics. It not only require practice but in Indian words "junun". 30 Dr. P. K. Panda, Chief Scientist, Professor, AcSIR, Group Leader, Ceramics and Functional Materials Group, CSIR-NAL, Bengaluru This e-book is a nice collections of examples of Innovations, innovative ideas. It has got valuable presentation materials on systematic approach to carry out innovations. It will be very useful for people who are already dreaming to be different and others to dream as well. 31 Ganesh Hiregoudar, Senior Manager at EMC, Former Senior Manager Cognizant Technology Solutions, Bengaluru Thanks for sharing this book, very insightful and appreciate your efforts. 33 Dr. M V Pitke, Life Fellow IEEE Congratulations on the excellent work that you are doing. I very much appreciate your contributions. 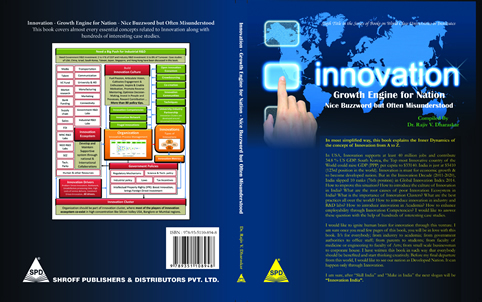 34 Pranshu Dubey, Chairman and Managing Director, Infallible Technologies Private Limited, Banglore I have read parts of the book and found it to be interesting having an altogether different perspective on Innovation. Kudos for that. 36 Srikanta Patnaik, Department of Electrical Engineering, University College of Engineering, Burla Congratulation for authoring a very good on Innovation. I have gone through your book and found it interesting. In fact Open Innovation is one of the area, where India can and shall excel. We applause the efforts taken and delivered an wonderful information in the book form. On-behalf of our nation i salute you sir. 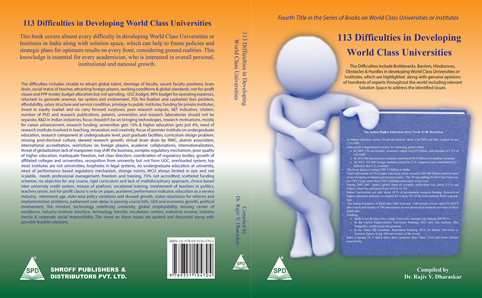 38 R.K. Singh, Director/Vice Chancellor, Indian Veterinary Research Institute (Deemed University), Izatnagar-243 122, India Its wonderful book… Lots of hard work which will benefit hundreds of readers. 39 V Salai Selvam, Associate Professor & Head, Department of Electronics & Communication Engineering, Sriram Engineering College (Affiliated to Anna University, Chennai), Tamil Nadu It is an outstanding contribution to the world of science. With reverence for your commitment and sincerity in giving your best to the Education field is commendable. It is a wonderful book very well written. I will send to my friends too. Wish you all the best for your new book! 44 Dr. J M Paliwal, Dean Training & Placement - Raisoni Group of Institutions Some or the other way people like you had been inspiration to the society. 45 Dr. S M Shiyekar, Ph.D. (IIT Mumbai), Department of Civil Engineering, Sinhgad College of Engineering, Pune We will wait for your next book like this. Dr. Riyaz A. Sheikh, Ph.D.
Congratulations to you for your new book and thank you very much for sharing it to me. I';would certainly circulate it with my colleague. First of all let me congratulate you for writing this book and Thank you for remembering and sending me the same. 49 Sarath Munasinghe Thank you very much for sending this valuable piece of reading. Congratulations on the excellent work that you are doing and much appreciated contributions. Surely will circulate in my network and forward to concern and be a part of your work. Hats off to your patience and your energy. On one side, the world is appreciating India’s spectacular growth in Space, Nuclear and Missile Technologies and many more fields. On other side, India slipped 10 ranks (76th position) in Global Innovation Index 2014. The Innovation is the Growth Engine for the Nation. The rate of Innovation depends upon National Innovation Ecosystem. Thus Innovation Ecosystem decides the rate of growth of economy of the nation. It is way to become developed nation. The nation can’t afford to neglect this vital issue. What is wrong with system? What is the reality? Where is the actual problem? We need to analyze the Bigger Picture “The Innovation Ecosystem”, in which the University is just one of the players. In the series of 5 books on World Class Universities, I could focus only on one player but that is not sufficient to enhance the entire economy of the nation. In fact, the World Class University (WCU) Model must be tuned according to Innovation Ecosystem of the Nation. The Bigger Picture decides the role of each player with respect to the national framework. If we understand this phenomenon then it is very easy to find out root causes and remedies of many national issues. 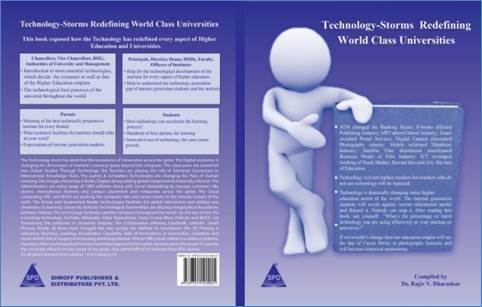 This is the reason, I have included this book in the series of books on world class universities. But remember that, here focus is not simply on university. I would like to cover Bigger Picture, which is based on concept of Innovation. In most simplified way, this book explains the Inner Dynamics of the concept of Innovation from A to Z. I would like to answer many vital questions like: How to improve this situation? How to introduce the culture of Innovation in India? What are the root causes of poor Innovation Ecosystem in India? What is the importance of Innovation Clusters? What are the best practices all over the world? How to introduce innovation in industry and R&D labs? How to introduce innovation in Academia? How to enhance employability through Innovation Competencies? I have quoted hundreds of carefully selected small case studies to justify the stand. I have divided the book in to 4 parts. The 1st part covers the various concepts related to Innovation and related case studies. In the initial 3 chapters, I have introduced almost every element mentioned in above diagram. These concepts are essential to understand the rest of the book. The 2nd part is dedicated for “How to inject innovation in to any organization?” The 4th chapter gives broad idea for developing Innovation Culture in any organization. In chapter 5, I have tried to highlight the difference between Research and Innovation. The chapter 6 highlights the role of university with respect to innovation. 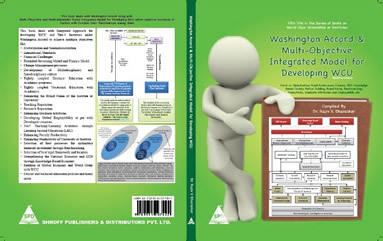 In chapter 7, various techniques for enhancing Innovation Competencies have been discussed. The way to introduce the innovation in to University environment has been discussed in chapter 8. In the 3rd part, I have highlighted the status of Innovation in India. I have also tried to present the detailed analysis of our National Innovation Ecosystem along with vital components. In chapter 15, I have explained the Frugal Innovation, which is secret weapon of Emerging Markets. In 4th part of this book, I have discussed the complex issues like GDP, Stages of Economy, Approaches of Developed Nations, Role of WCU, National Policies and International Scenario. In chapter 16, I have discussed the relationship between developed nation and WCU along with Innovation. In chapters 17, 18, and 19, I have discussed the Innovation Ecosystem of South Korea, Japan, Taiwan, USA, China, Israel, Hong Kong and Singapore, which gives the clues to develop strong Innovation ecosystem suitable to Indian culture and environment. From small scale businessman to corporate house. 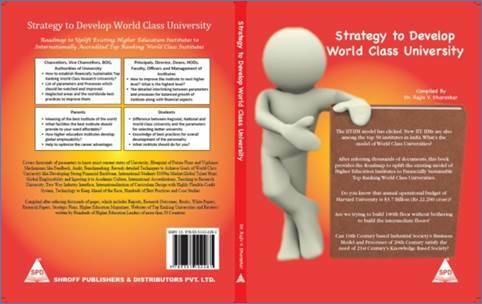 I have written this book in such way that everybody should be benefited and start thinking creatively. The Details are available with shroff publications. Please Click Here.